Highlights include: School 99th birthday, learning conferences, traffic congestion, sports news, midwinter swim, ERO visit, Highlands information, Four year old Fridays, and much much more!! 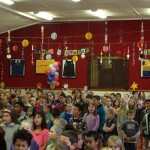 As part of our 99th birthday celebrations, we held a disco in the hall which was decorated with a ‘happy birthday’ theme. The children were invited to bring along a handmade card to the school as their ticket in, and we had glow accessories for sale too. It was a fantastic night. Thank you to the Home & School team who organised another successful event for our school community.